We must not be complacent about the dangers of infections – antibiotics and vaccines have their limits! This book shows us how to maximise our defences and martial our weapons so that we are ready to defeat the infectious organisms we encounter every day. We can win the arms race. Dr Sarah Myhill qualified in Medicine in 1981 and has since focused tirelessly, in the NHS and privately, to identify the causes of the western epidemic of chronic health problems and find solutions. She is the author of four other books including Sustainable Medicine: whistleblowing on 21st century medical practice. Easily readable and gives tools for anyone to help prevent infections and how to treat them if one succumbs. This book, and the remarkable Dr Myhill, truly did change my life. Should be on the shelf of anyone battling chronic illness. No quackery. No holding back. Gives you the information you need to keep yourself healthy and to fight off any infection before it takes hold. Brilliant woman. Gives you the information you need to keep yourself healthy and to fight off any infection before it takes hold. Brilliant doctor. Sensible, knowledgeable, very helpful and easy to follow advice from the brilliant Dr Sarah Myhill and her caring, experienced, patient and co author Craig Robinson. This latest book goes further to help people suffering with chronic illness, to realise that there is light at the end of the tunnel. Also very helpful to anyone who wishes to keep infections at bay before they take hold. Just shows what happens when a doctor listens to patients and patients listen to their doctor. What a model for the future! This combination of Sarah Myhill and Craig Robinson demonstrates how the caring profession and lay person can cooperate for the good of science and the good of humanity. Yet another superbly informative read from Dr Sarah and Craig – a must read in my view! So much great advice as to how to boost your immune function, fught infections and stay healthy. Dr Myhill never pretends to have all the answers, but she certainly has a lot more of them than most doctors. I have found this book life changing. A recommended read for everyone who values their health whether they are currently ill or well. If only other Doctors has this levels of knowledge and generally wanted patients to get better instead of just substaining patients illness it would be life changing for many patients. At least Dr Myhill has put her knowledge in to this book so that she can help people help themselves. ANYTHING WRITTEN BY DR. MYHILL IS BOUND TO BE FULL OF WELL THOUGHT OUT PRACTICES AND COMMON SENSE. I WILL BE ADDING IT TO MY COLLECTION. which includes M.E mitochondria not hypochondria ! Dr myhill is a massive inspiration especially to a group of m.e sufferers and many others worldwide. I have her Pk diet cookery book and Mitochondria not hyperchondria. Dr myhill gives us hope we feel heard and more so shes an expert in the illness helping so many sufferers. If only all Doctors had the knowledge in this book…natural healing and sensible advice rather than reaching for the pharmaceuticals. Dr Myhill really knows her stuff. An inspiritaional Dr who changes lives ,forever in your debt Dr Myhill. Flu season… get a copy NOW and spread the word… Highly recommended. Sarah Myhill has convinced me! She lays out the info in a logical, scientific, yet accessible and engaging manner that has given me the confidence to take hold of my own health. I’ve also looked into her claims of Vit C being anti fungal/bacterial/viral n that high doses to bowel tolerance work (Theres a case study from 1935-ish that stood out for me of Polio being cured with high doses of Vit C … that info has been in scientific literature for DECADES and many studies have been done on high doses of Vit C with remarkable results, yet Vit C cannot be patented and thus it’s not pushed into the education of your average GP XD). Dr Myhills knowledge is massively important. Dr. Sarah Myhill is one of the top General Practitioners (GP’s) in the country and one of many top experts in the field of Myalgic Encephalomyelitis. Dr. Sarah Myhill should be on the review committee involved with rewriting the Nice guidelines for Myalgic Encephalomyelitis, as she is more qualified than most on the topic, because she’s written a book on the subject and because she’s treated many people suffering from M.E. and who has been involved with creating a mitochondrial test and mitochondrial dysfuntion is a key factor within M.E.. Her wealth of medical knowledge has helped people greatly within the M.E. commmunity, who have been failed by the conventional medical establishment. She has been targeted by the General Medical Council 30 times and also won every case against her, so she’s clearly doing something right… to ruffle, so many feathers within the medical establishment and “postage stamp consensus thinking”. She’s a medical trailblazer and a thorn in the side of the obsessive-compulsive thinking that reigns supreme, within the conventional medical establishment. I hope conventional medicine changes to reflect real life circumstances and not to reflect the problems originating from a replication crisis and from disordered thinking patterns, within science and becomes personalized to each individual as studies can not replicate individual circumstances or even accurately reflect an individual’s unique biology with absolute precision. This book is a must read for everyone. It covers all basic infections and is full of essential information to treat infection and keep well. I love the books that Dr Myhill writes. She is an outstanding person and I value and appreciate all the work and study she has done for people with long term health problems. I have Myalgic Encephomylitis and have found Sarahs contribution through her books to be in a league of her own. I will be ordering this book also. Dr Myhill is someone who really understands health in a systemic way and is able to explain key scientific information to a general audience. She is making a great personal contribution for people suffering with Myalgic Encephalomyalitis at considerable personal risk. A quite extraordinary book that demands a wide audience and then some. Dr Myhill is remarkable and a true hero to the many patients with autoimmune and other chronic conditions who have been let down by conventional health ‘care.’ Those with Myalgic Encephalomyelitis in particular can vouch for her wise and life-changing advice freely available on her website and in her earlier book ‘Mitochondria not hypochondria’. Her book dealing with diabetes is also extremely helpful. She has wide experience and knowledge of nutrition and the body’s processes and can put this across lucidly and practically. She learns from her patients, giving them hope, sometimes for the first time. This latest book of hers is another gem. This is yet another excellent book from Dr Sarah Myhill! As a lawyer, I take nothing on trust and insist on evidence. I totally trust her expertise as a leader in the field of treatment for ME, and her knowledge and commitment to prevention and treating the cause of illness rather than suppressing symptoms with toxic drugs. Having ME, I was already following Dr Myhills advice to the letter; so at the first signs of shingles on my face, I went to war with guns firing after reading The Infection Game and won big time. This book is not only hugely informative, it’s an absolute delight to read, as are her other three books. There are no words to describe my gratitude for the very existence of Dr Myhill; she has changed my life for the better as no other, since virul onset ME in 1980. Our wonderful Dr Myhill empowering us with her accessible easy to read book on how to tackle all kinds of infection.What a fantastic idea! Just what we need when the mainstream options, antibiotics and vaccines,become increasingly unattractive.Every home should have a copy of this book. Dr Myhill approach in treating the individual, (not the blood tests!) alongside Tony Robinson’s tremendous insights and research ensures this will be an empowering read and I shall be adding it to my collection of their books. I have been greatly helped by both authors. Dr Myhill works endlessly to help others in a refreshing, inspiring way that works! Listening to the patient is a MUST for any GP, but sadly many fail to do this. Dr Myhill is a breath of fresh air, highly inspiring and ready to share novel ideas to all. Everyone could benefit from this book, especially in our current era. All her books are my “go to” before any other. Thank you Dr Sarah. Dr Sarah has been an essential part of my ongoing recovery and her books are always kept close to hand. So reassuring to know people like Dr Myhill are looking deeper at how modern Medici e is getting it wrong, and as a result making us more susceptible to illness and disease. She has clearly looked long and hard at what the received medical view is on many medical treatments and seen they are against nature. When will GPs stop getting us to lower our temperatures when sick? Madness. So it’s wonderful to have the simple and easily doable interventions that dr Myhill offers and describes in simple, straightforward language. Everyone should have this book at their bedside, especially GPs. It should be prescribed free by the NHS, it’s SO important and looks at the cause not just the symptoms and connections that may or may not be valid. Read it then read it again. spot on advice and treatments,tests etc during my 30 yrs of m.e. Sarah Myhill is a class act and should have her name in lights; this is a cracking read and tells us indirectly why the NHS needs rethinking. I feel better already – Sarah Myhill is an Angel!! Words fail! Dr Myhill’s books are my bibles and without her wonderful work I would still be in the ME doldrums. Keep them coming! If only there were more like Dr Myhill. She has helped me so many times and in so many ways that I have lost count. Where the NHS just prescribe the usual drugs she offers sensible advice based on her years of experience. I, like many others, would be totally lost without her. Every home should certainly have a copy of this book – it’s amazing. This book exceeds my expectations! 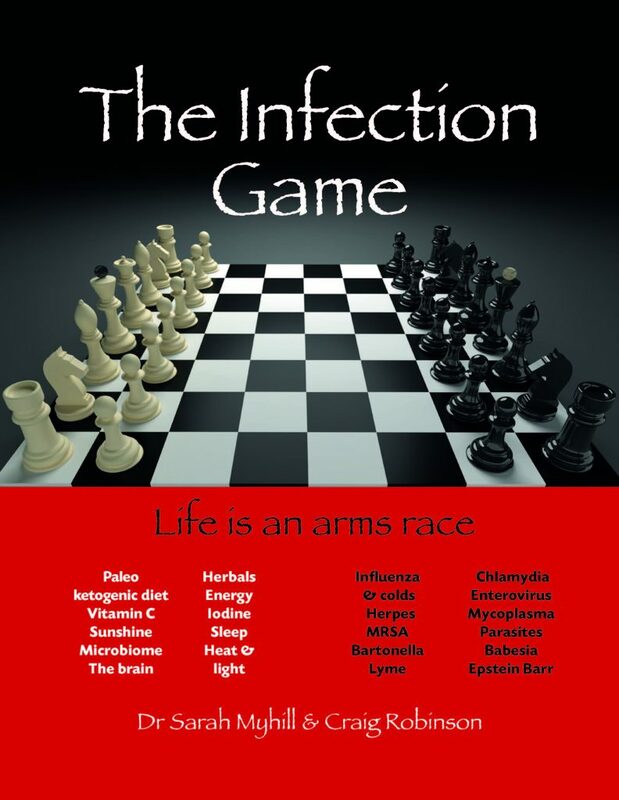 Thanks to Dr Sarah Myhill and her excellent book “The infection game”, sufferers of chronic infections and all types of difficult infections, now have the chance to take on the fight against the microbes which have conquered their bodies. Where governments, socialist medicine, big pharma and private quacks have miserably failed to help and instead caused enormous suffering and harm among patients with infection driven diseases, Dr Myhill offers theory and practise for fighting the root cause, namely infections. Finally, a very real humanist Medical Doctor and Scientist, who reasons, behaves, works and speaks in the way that we thought that a doctor would, before we ever needed medical care. Hippocrates would be proud over her. Sarah Myhill has been hugely helpful to my family over many years. This book is a very readable and sympathetic resource which details her approach. Thank you. Just brilliant, so much common sense. It should be on everyone’s bookshelf. An amazing book, everyone should have a copy! What a brilliant book! Clear, comprehensive, safe advice, a must for every practitioner and patient! Dr Myhill is the best GP and M.E. specialist I have ever come across. Thank you so much for sharing your impeccable in-depth knowledge of medicine and your wisdom with us all! Dr Myhill (and Craig Robinson) does a great job at combining all she learned throughout her medical career. After seeing first-hand some of the limitations (within our current system) by not keeping up with the research, advancements and findings within that same system…and analyzing what makes most sense to deliver a combination of preventative and curative / restorative options for patients to benefit from, and actually restore optimal health, regardless of their age, or current condition (dis-ease state), her pursuit of better methods to analyze and determine what’s actually happening within our bodies & bloodstream, led her to more precise and definitive diagnoses. After leading efforts to make use of high magnification observations (using SEM on live blood samples), and discovering / proving beyond a doubt, a / the major commonality and source of underlying root cause for dis-ease (lack of ability to optimally return to homeostasis)…aka toxin overload…after seeing conclusively in 100% of her patients (after over 1,000 tested), her pursuit of putting together a “best methods” for toxin cleansing, based on effectiveness, cost/ affordability, availability and ease of use….exemplifies her commitment to put patients (and measurable patient outcomes) first. The concept that whenever / wherever we have states of “dis-ease”, or sub optimal healthy environment within our tissues and organs…leading to something less than ideal oxygen utilization, cell function, energy / ATP production….those areas become breeding grounds (more attractive homes) for viruses (bad bugs, whether virus, bacteria, fungi, or parasites) to be attracted to…has been known, but unfortunately not paid attention to within normal medical channels. Perhaps due to most folks following “status quo” / current conventional standards (we are clearly not in the habit of practicing preventative medicine). Regardless of why, perhaps we’re getting closer to widespread acceptance of these findings (no longer should they be considered as theoretical, now that SEM level viewing has confirmed them conclusively). Hopefully her hard work, willingness to persevere through much adversity and professional peer pressure…and dedication to follow the oath she took as a physician / medical doctor, and her allegiance to patients, will stand out as an example for many others to follow her lead (as soon as anyone within the medical systen….regardless of their role…: nurses, device or drug manufacturers and sales & support teams, hospital staff / personnel- including everyone from the janitor to the CEO…overlooks our obligations to putting the “customer” / patient first, we take steps down a slippery path, which has clearly led to where we are now…forgetting why we have a “health care”/ health restoration system in the first place….and also why as it currently stands, most people who still maintain an general awareness, are convinced they need to look elsewhere for what’s best for them. In short, “status quo has to go”….and until we make collaborative, consistent and comprehensive efforts to change….in many cases, we may be better off getting advice from the janitors vs CEOs. We could use about 1,000 physicians (per month) to follow in Dr Myhill’s footsteps, working together to uncover (and share) best of the best methods / steps / treatments to restore optimal health and prevent & reverse dis-ease. Ironically, the more we look, the more clear and simple the solutions turn out to be. Doctor Sarah Myhill is an absolute genius. Everything the Doctor writes is common sense. More people need to be educated about what she writes/talks about. This is another wonderfully compulsive read from Sarah Myhill. She has clearly helped many people and I am one of them. After appalling treatment from the medical profession I found Sarah who was everything a doctor should be. I am eternally grateful to her for her care, her kindness and her knowledge. This book, together with her previous one, should be on every doctor’s reading list. Dr Sarah Myhill has been noticed, praised and, yet, still, persecuted in the past, for giving people a voice. From my personal experience, her knowledge of the Conditions she understands shines through with a genuine empathy, to empower, and give hope to patients, when other GPs have merely attached “sticky labels”, that erode one’s core self and self-belief, even more. Through her life-long dedication to continued research in respect of mitochondrial function, adrenal support and thyroid function, ( to name but a few!) and her understanding of how the body can be allowed to work well without pharmaceutical intervention, she has demonstrated a truth, without jargon, which works. When I changed to her Paleo-Ketogenic regime, within two weeks, my body was almost saying to me, “This is what you should have been on from the start of your life!”. As a Counsellor, I have seen many CFS patients, and there is not one whom I have not recommended to Sarah Myhill’s website for advice, and as a lifeline of hope. In my eyes, Sartah Myhill is 110% genius! I have gone from living in a fog to thinking clearly for the first time in decades. Would never have thought this was possible. Bless you Dr Myhill and team. This is a book that every home should have! Dr Myhill is a brilliant doctor who has done so much for patients with ME – I am deeply grateful for the information, research and advice which she makes available and this book is to my mind the best so far. So much wisdom and the book is so well written and organised (thanks to Dr Myhill and co-author Craig Robinson). I have my own dog-eared copy and have bought 2 for friends. Fabulous detail. Dr Myhill and Craig talk to each other in the book. This gives a welcoming style, and helps to convey the ideas in an ‘easy-breezy’ style! Love it! The most useful book on the boOk shelf! Yet again Sarah and Craig, a Marvelous read! Thank you. An easy to read book that gives the reader the tools to better / good health. Sarah and Craig have put together an excellent self help book that I fully recommend should be on everyone’s book shelf! Another brilliant book written by Dr. Sarah Myhill & Craig Robinson. 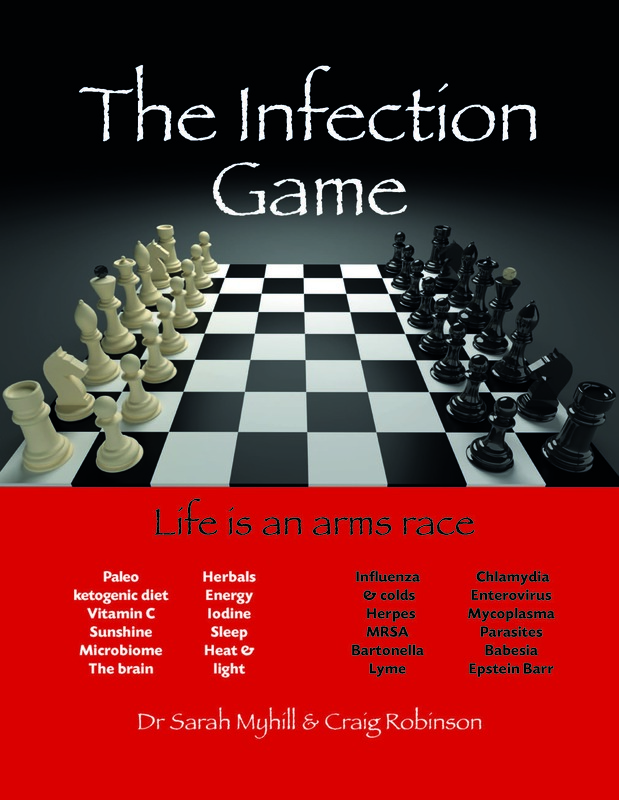 ‘The Infection Game’ was eagerly awaited & didn’t disappoint. Well written & easy to read, MEGA informative, sensible advice, with a wicked sense of humour here & there. So grateful that it helps those like ME, that have been, in many ways neglected, suffering with chronic illnesss, left to their own devises. Brilliant ! Would not be without this book.It has really helped.Easy to dip into and to read. Out of all of Dr Myhill’s excellent books, I find myself returning to this one most often. It’s easy to understand and the index helps me look up new symptoms as and when they surface, and find treatment options. I keep it next to my bed for easy reference and highly couldn’t be without it. I have nothing but praise for Dr Myhill. I have two of her books already (PK Cookbook & this one also, The Infection Game) – with a possible 3rd to follow soon, to do with sustainability, which is VERY much following my own beliefs as to what and where medicine and the NHS SHOULD be doing, with is to treat the causes of illness not the symptoms, as we do now: And we (all?) know why: Big Pharma and the indoctrination of those in the health profession, who if they step out of line (i.e. don’t TOW the line, according to big Pharma) they’ll have their practicing license removed, which is VERY concerning. Dr Sarah Myhill is very matter-of-fact and knows her subject to a great depth, and above all CARES for both her patients, by risking/daring to speak out about health protocols and treatment, but is courageous enough to do what she feels in her gut. I can’t think of anyone who cares more about the truth, and getting the message out there on the wider stage. This book represents a beacon of light in an otherwise murky, mystical place as far as health goes, and hits a few home-truth buttons. Well done Dr Myhill, you have my vote, for sure! Excellent and informative. A must read. Brilliant book by a brilliant doctor who genuinely wants to look at root causes of illness. This should be the model for the future. Dr Myhill has changed my life, I was just at the point where I was going to have to give up working because of undiagnosed fatigue. Her treatment plan has got me back to 80-90% of normal. This book continues here clear explinations of what she has found out, to help everyone. Another excellent book from Sarah Myhill, informing and enabling us in the quest for better health. It’s raised my awareness and handed me the tools for self care. It is an extraordinary book. Thank you to Dr Myhill for all of her enormous efforts to help people with ME! She bravely and determinedly persists even in the face of conventional medicine trying, but failing, to discredit her. People, like me with ME, are immensely grateful to her for her determination to find help for us despite the fact that we are not an homogeneous group but have a wide variety of infections and complications. I am particularly grateful as conventional medicine have simply held their hands up and said they can only manage some of my symptoms but the prospect of actually attempting to improve my health is not even on their radar! This book is vital for anyone with ME. I take Dr Myhill’s Emergency Flu Pack with me whenever I travel (even for a weekend)! If I do everything she suggests when I feel a cold or flu type symptoms coming on, it helps tremendously. If it doesn’t stop the infection in it’s tracks, it ameliorates the effects so that one is not totally wiped out for days or weeks. I had never heard of a salt pipe before, but now I’m addicted! Dr Myhill and Craig Robinson are two of the most intelligent, learned and wonderfully compassionate people I know and I highly recommend this excellent book. It is full of cutting edge medical information but also practical approaches to one’s own health situation and battling various infections. It is beautifully written and also delightfully humorous as well. Do buy it as you will really enjoy reading it! As someone who has suffered with chronic infections for years, this is a brilliant book that I wish I’d had access to years ago. I’m delighted to add it to my Myhill/Robinson combo collection. Thank goodness it’s presented in this accessible format too, which is essential for those of us with reduced cognitive functioning. It has a fantastic depth of knowledge, from both a clinical and patient perspective, providing a simple toolkit to help you take responsibility for your own health. Which surely is what we should all be doing! Using the information from this book would surely take the strain off the struggling NHS. Without the knowledge & dedication of Dr Myhill & Craig Robinson, I would not have improved my health as much as I have. With future improvement in energy levels, I will be encouraging my circle of family & friends to have their own copy of this book!!! Once again, Dr Myhill breaks new ground (and the medical consensus) with an overarching piece of work that’s essential reading not only for chronically ill and disabled people, but anyone wanting to lead a healthy life. Dr Myhill and Craig Robinson’s books are the most useful books on my bookcase! It’s lovely to be able to recommend them wholeheartedly to friends too, and know that they’ll be helped by them. I consider myself very fortunate to have access to this information, and thank Dr Myhill and Craig for sharing their extensive wisdom! I am eternally grateful to Sarah. This book is so informative and easy to read in equal measure. You can read the book in full and then revert to specifics. Full of practical advice and realistic down to earth. Good health is all within our reach, ignore Big Pharma! Hard to do but this book gives you the confidence to rely on good old fashioned common sense based on solid real medicine. Dr Sarah Myhill should be awarded a medal! If she were my Doctor, my CFS would have been sorted out years ago, she’s my heroine!! Incredible detail and advice and it works! Dr Myhill and Craig work so well together as a team – you get the impression that they have very different minds but that somehow this coming together works so well! Massive thanks to Dr Myhill – she has given me my life back! Big shout out to Craig also, who does so much for the ME Community in the UK, and also Kathryn Twinn, who is Craig’s joint admin on the Dr Myhill Facebook groups – they both work so hard online for us all. Dr Myhill is one of the most formidable authorities on finding methods in progressing the treatment for M.E. when the vast array of the Public Health Service has failed its patients who are so desperately in need for support. Her book is – as would be expected -very clear, comprehensive and so massively important on the subject. Many thanks Dr. Myhill. Another fab book filled with incredible information and advice on how to look after oneself. Thank you Dr Myhill. A great insight to a huge problem and what to do next. GPs need to read this! My family’s experience with Dr. Myhill has been very positive. She is a truth-teller and deeply knowledgeable about the body’s ways.